A couple of weeks ago I was out at the Rueck Farm doing some stuff for work and my relatives Clarence and Dolores Landis were out there gathering apples in cool baskets. I haven’t spent much time at the farm, sadly. I feel like I’ve missed out on a lot of cool stuff. The other day I was asking my dad about the history of the farm and of our relatives that have lived there and I wrote down some notes. One day I’ll write about it on my site, mostly for my benefit, to learn the history that I never really knew about. Anyway, the farm is a beautiful place. It’s mostly orchards–filberts, walnuts, plums and at least one apple tree (though I’m not sure where they all are). I grew up in the city and I love big cities, but it is a wonderful feeling being out at that quiet, peaceful place under the beautiful canopy of huge oak trees with the amazing harvest-time scents in the air. One of these days I will bring my camera out there and take some photos to try to capture part of what it’s like. 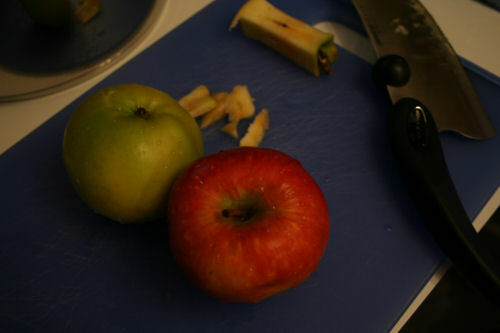 So, back to the apples. Clarence and Dolores were loading all these baskets of them into their minivan and talking about who they were going to give them to, and I thought it would be nice to bring a basket home myself. 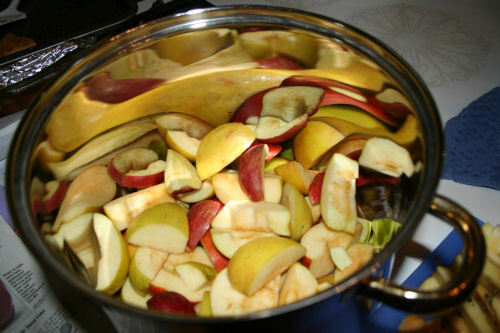 I had seen some jars of applesauce in the basement of one of the houses out there and it looked so good. So, I asked if I could take one and they graciously let me. My grandma and my mom made a great deep dish apple pie with some of them before I had a chance to make anything, and then about a week later I finished them off by making a pie myself(with some assistance with the recipe from my mom) and a nice big pot of applesauce. These are just a few photos from the process. Enjoy! 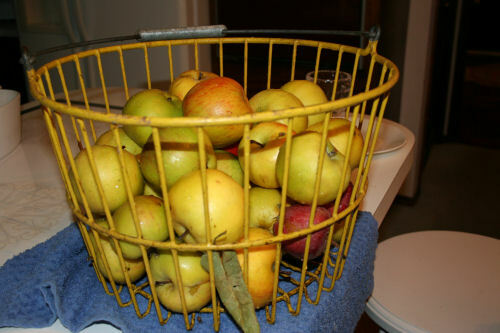 For some reason seeing the apples in this basket from the farm made them look so much more attractive than if I had just bought a couple of bags full from the grocery store. There were a variety of perhaps three different types of apples that they put together in the basket. They told me what they thought they were, but I don't think they were absolutely sure. Here are a couple of the varieties. 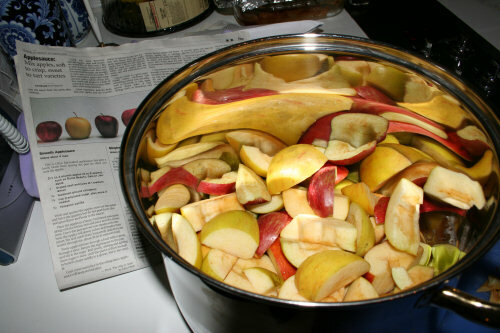 These were the apples cut in eigths or so ready to cook to make the applesauce. I used a recipe that my friend Ariel's parents found in the Oregonian and let me borrow. There were four different recipes, but I used the one for "smooth applesauce". I think it was a good one. 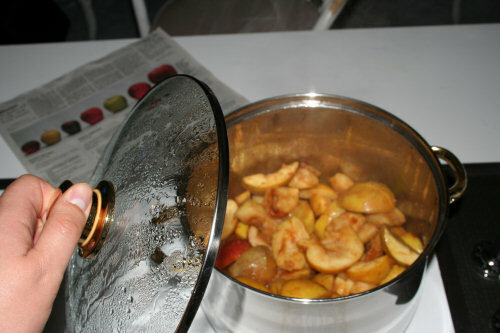 The smell that came up from the cooking apples with the cinammon and other seasonings was so wonderful. 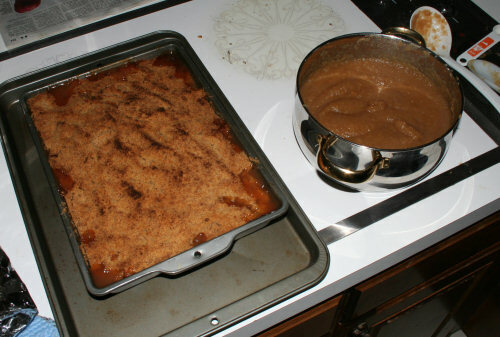 Here are the finished products, one tasty deep dish apple pie and a pot of yummy applesauce. This is sort of an anti-climactic ending photo, but this is my Grandma's food mill that I used to get the applesauce to the right consistency and to filter out the peels. 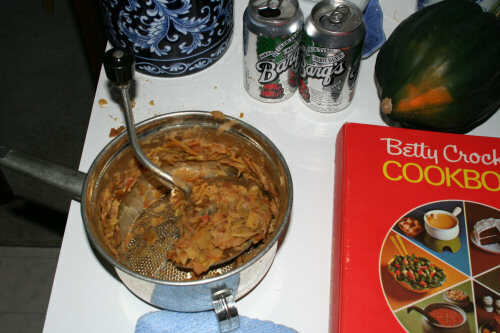 It also shows the source of the apple pie recipe and references to how late I stayed up cooking--a couple of empty cans of my beverage of choice.